The dogs who were given a treatment that repaired their defective myotubularin gene avoided the crippling muscle degeneration that killed the placebo-treated dogs by week 17. And by the ninth month of study, the saved puppies’ muscle and neurological function continued to match readings from healthy dogs, particularly for those that got the highest doses. 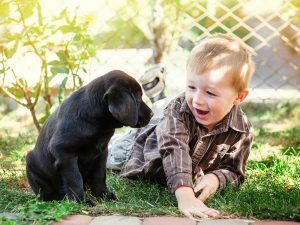 The findings, building on an earlier proof-of-concept study of dogs and mice by the researchers, signal that a scaled-up treatment could save the lives of boys with the same sort of genetic flaw. X-linked myotubular myopathy affects young boys, both human and canine. We would love to see a world where neither have to suffer from it. Animal science working at the genetic level to improve the welfare and lives of multiple species — this is just some fantastic work! PS. if you were at our annual conference last November and this sounds familiar, you aren’t imagining it — there was an inspiring (and tear-jerking) presentation about the animal-based research that is bringing us closer to a cure for x-linked myotubular myopathy. This would be a good time to remind you to plan for the 2017 NAIA conference, Oct 2-4 in Washington DC! Hello animal lovers! Are you a member of a dog club? If so, see if you can come as a representative of your kennel club at this year’s NAIA Conference, October 31-November 1, in Orlando, Florida! This year’s presentations are especially valuable to dog fanciers, as we have several nationally renowned animal scientists, veterinarians, and husbandry experts speaking on the issues of breed preservation and genetic health (especially in the face of shrinking gene pools) — this is all highly useful information that can be put to practical use in breeding programs – improving the health and well-being of the dogs we all love! This is going to be a great conference, and we hope to see your club represented! For more conference details, including signup and lodging information, click here. And if you aren’t sure, check to see if your club is already a member of NAIA — if so, you will receive a discount, but please contact soon via email or phone to make arrangements! NAIA 2014 Annual Conference: Thank You! It is hard to come up with enough superlatives for this year’s NAIA Annual Conference. Every year, we are blessed with speakers possessing expertise, passion, and a gift for explaining the importance of their work — and every year, the event grows and improves. Our conferences consist of people from such varied backgrounds: agriculture, science, hobbies and sports, rescue, public health, and business owners just to name a few. But they are all brought together by their dedication to the animals in their lives and their desire to share their stories in a way that empowers others. 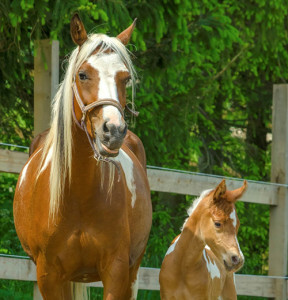 This year was no exception: topics as varied as the chilling effect of activists on animal science, indigenous hunting rights, the fight for the carriage horse industry, food freedom, the landmark $25 million settlement paid by HSUS, ASPCA, et al. to Feld Entertainment, the current state of animal activism (“anarchy”) in the UK, and HBO’s hit piece on the AKC (Unnatural Selection), there was indeed something for everybody! To everybody who presented, attended, and volunteered: thank you! We can’t do it without you — and we can’t wait to see you again next year! Sign Up Today for the 2014 NAIA Conference! 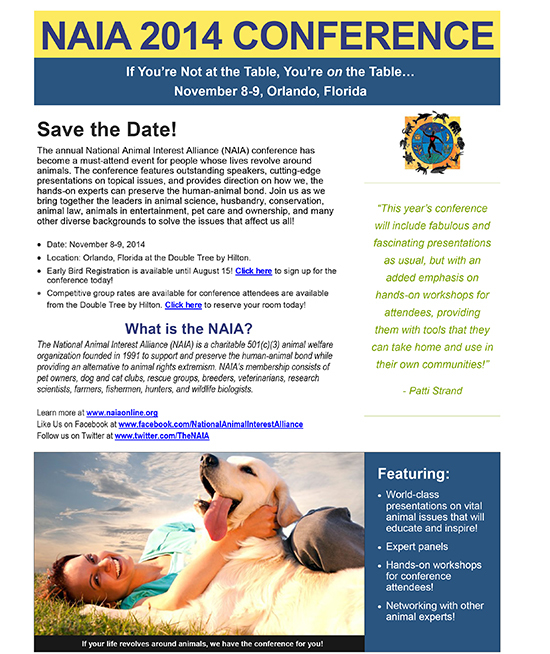 Spots are going quickly for this year’s NAIA Conference — sign up today to reserve your space! Cindy Buckmaster, PhD Neurobiologist, Chair, Americans for Medical Progress, Director, Center of Comparative Medicine, Baylor College of Medicine: Speak now or forever rest in peace. It’s that time of year again, that special time when we start gearing up for our annual conference and reminding folks that there is less than one month remaining for early bird admission! Times are changing, if you aren’t actively helping to shape the direction and philosophy of animal welfare, you will find yourself left behind. If animals are an important part of your life — whether you are a professional, hobbyist, or simply an animal lover — this is the event for you. As always, our conference will be chock full of presentations from world-class scientists, trainers, and conservationists, as well as hands-on workshops to provide you with valuable tools you can use to take control and shape your future. Actively shaping your future is vital: if you’re not at the table, you’re on the table! Stay tuned for more details on speakers and workshops in the coming days. Click the image below for flyer.